we just get started a little earlier! Join us as we continue this year's Arizona Sunrise Series presented by First Watch with our third leg at Freestone Park! This event features a 5K distance and is limited to 600 participants. And don't forget - this is a StartLine Racing Series which means big prizes!! 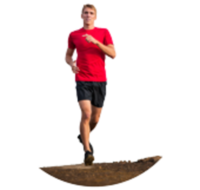 Get points for every event you complete, with extra points being awarded based on your age group and overall finish. At the end of the series the top 100 point earns, plus all participants that complete at least 4 of the 7 series events, will be entered into our Arizona Sunrise Series Prize Drawing. 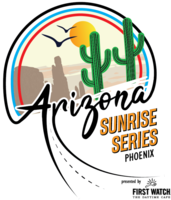 Check out the full Arizona Sunrise Series Rules and Regulations here. Register for the entire series here. Of course we want you to participate in the Arizona Sunrise Series locally but we understand things come up. So, if you can't join us at Freestone Park and still want to run, get the medal and a shirt then you still can! Here is your chance to take part in this event no matter where you are! And of course, all prices include shipping! Please note that all items will ship following the first event on June 22nd. Because this is part of a series you will receive the main medal plus the attachment for this event only. You will not receive all 7 attachments. If you wish to register for the Virtual Series please visit us here. Prior to the event all virtual participants will receive an email with instructions on how to submit your time. - Course set/marked by StartLine Racing to maximize your experience! Race Day Registration will be available beginning at 5:30am at Freestone Park. Please note that your shirt size is not guaranteed on race day. Friday, June 21 2019 from 4:00 - 7:00pm at Road Runner Sports in Tempe (map). Saturday, June 22 2019 at Freestone Park (race location) beginning at 5:30am.